The U.S. oil and gas infrastructure market is set to grow from its current market value of more than $70 billion to more than $80 billion by 2024, according to a recent study by Global Market Insights Inc. Ongoing investments for the expansion of existing refineries along with along with establishment of new units with environmentally friendly footprint will positively influence the U.S. oil and gas infrastructure market growth. Furthermore, rising gasoline demand from Mexico on account of the country’s growing automotive sector has led to planning of new refineries in the nearby regions of the U.S. will complement the industry landscape. Availability of proved gas reserves coupled with incessant increase in natural gas demand will augment the oil and gas infrastructure market share. Moreover, the government efforts to reduce generation of electricity from coal has resulted into inauguration of new natural gas fired power plants and modification of coal into natural gas, which will further complement the business landscape. Southwest, in 2017 accounted for more than 30 percent of the U.S. oil and gas infrastructure market share. Availability of major shale plays in Texas including Eagle Ford and Barnett shales will drive investment across the region. Moreover, high energy consumption across industrial sector will positively influence the industry growth. Rising demand for gasoline from a wide array of industries, primarily power and automobile will fuel the refining and oil products transport market growth. The U.S. has witnessed an increase in the consumption of gasoline over past few years. Furthermore, incessantly increasing export of crude oil will drive investment toward midstream oil and gas sector. 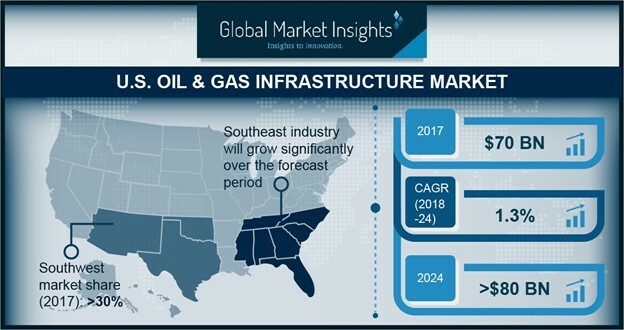 Southeast oil and gas infrastructure market size is set to witness growth owing to the retirement of coal fired power plants which has led to the addition of gas-fired capacity. 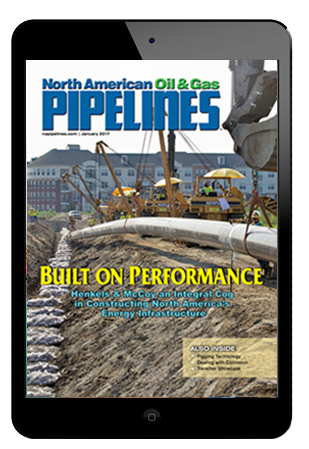 Moreover, expansion of regional pipeline networks to bring shale gas to serve gas-fired generation will encourage investment toward midstream sector.